The perfect blend of vintage and glam. Pure brass adds an elegant touch to our finest Penguin Super Silk* flag. It's simply too glamourous to miss. 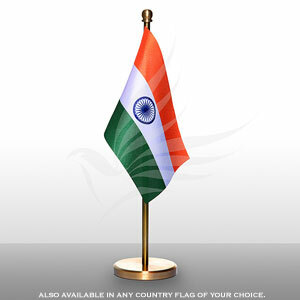 One of our most favourite table flag amongst corporates, it is a MUST-HAVE if you prefer an antique and classy touch. As the flag accessories are of pure brass, it would require to be polished from time-to-time due to oxidization.